M65 and M66 are a part from The Leo Triplet, a well known conspicuous grouping of galaxies (also known as the M66 Group). This is a small group of galaxies about 35 million light-years away in the constellation Leo. 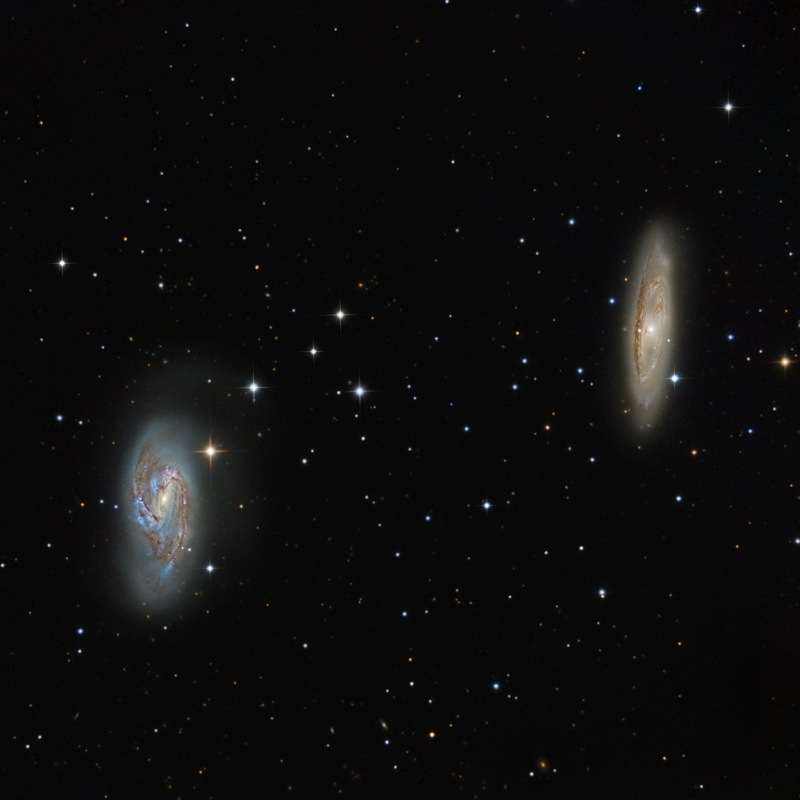 Halton Arp includes these galaxies in his entry number 317 of his Catalogue of Peculiar Galaxies, which denotes the Leo Triplett. This galaxy group consists of the spiral galaxies M65, the M66, and the NGC 3628 (not presented here). They are physically and dynamically related. The distance between M65 and M66 is only 160 000 light years. M66 shows some disturbed features believed to be related to the remote encounter. It's spiral arms are deformed, and they seem to be distorted and displaced above the plane of the galaxy. M66 is considerably larger than its neighbor M65 and has a well developed but not well defined central bulge. In spiral arms can be seen much dust and a few pink nebulae, signs of star formation. M65 looks like a very "normal" Sa type spiral and seems to have felt little influence. It has a prominent central lens and tightly wound spiral arms, and a vertical lane of dust in the eastern (left-side) edge of the galaxy. The luminous disk is dominated by a smooth old stellar population. Near the lane, some knots are visible, which, may be associated with star forming regions. SN 2013am - Type II (References: ATEL 4910, CBAT TOCP): On 21.638 March 2013, M. Sugano, Kakogawa, Hyogo-ken, Japan reported the discovery of an apparent supernova in M65. The object received its official designation, SN 2013am (CBET 3440). The coordinates of SN 2013am are R.A. : 11h18m56.93s, Dec: +13°03'49.3". It is located 15".3 east and 103".2 south of the center of M65 (Discovery image).